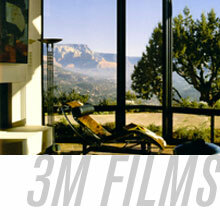 Technology has changed since 3M invented window films in 1966. Back then, increased sun control or heat gain reduction performance resulted primarily from depositing heavier levels of metal on a polyester film. However, this increased performance sacrificed the film's visible light transmission. Since then, 3M has developed films that manage the solar spectrum selectively. 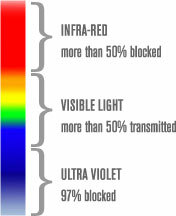 What this means is that selective wavelength films block more of the near infrared or heat portion of the spectrum and less of the visible light. Selective wavelength films provide an improved balance between performance and light. The unique engineering, construction, and use of materials allow these special films to let the natural visible light shine without a compromise in performance. This is important to many of our clients today as they strive to use natural visible light (day lighting) in their buildings. With 3M's selective wavelength films, our clients can better maintain energy-efficient natural light and still help control temperature imbalances within the building.